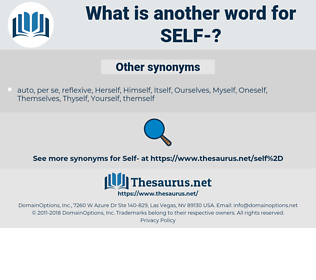 What is another word for self? Capita, vitae, selfsufficiency, selfassessment, selfregulation, self-fulfilment, soul-searching, self-sustainability, subjectivity, machine. self-care, self-running, self-government, self-initiated, self-sustaining. self-assessment, self-government, self-reliance, self-sufficiency, personality. 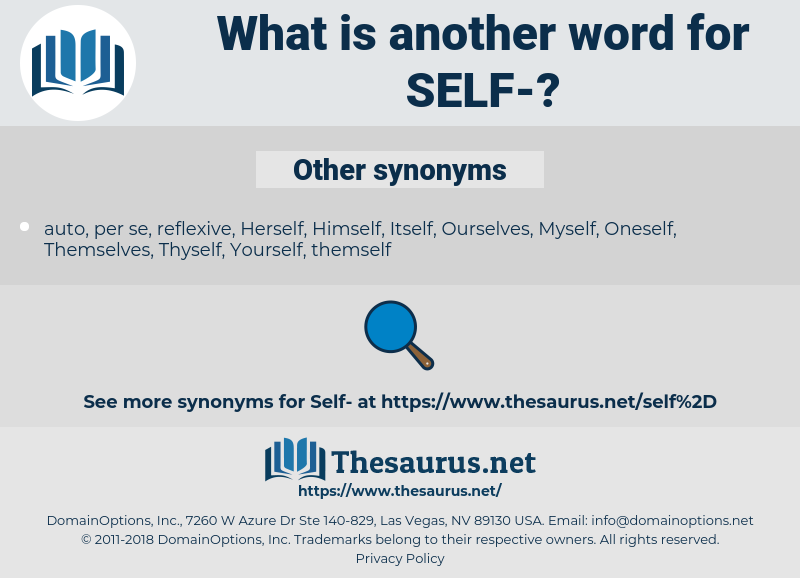 self-esteem, self-rule, self-regulation, self-respect, self-confidence, self-administration, selfcare, self-worth, self-assessment, self-restraint, self-care, self-government, self-reliance, self-sustaining, self-examination, self-empowerment, self-interest, self-sufficiency, personality, automaticity. dappled, trichromatic, speckled, dotted, specked, checkered, plaid, striped, piebald, colorful, kaleidoscopic, flecked, spotted, brindled, barred, tricolor, variegated, rainbow, pied, pinto, shaded, bichrome, mottled, polychrome, Skewbald, polychromatic, patterned, motley, varicolored, varied, bicolored, marbled, banded, multicolored, dichromatic, chromatic, streaked, parti-color. William laughed again, like Odin's self. But of course she must take care of her own dear self. school phobia, sylph, saliva, seal off, salpa, solvay, sillabub, salp, slip, sleepy, slipway, slaphappy, shelve, scale leaf, slip off, slippy, sell off, selloff, shelvy, scollop, slub, silvia, silva, salvia, sloppy, shelf, sulpha, sleeve, schlep, selva, sulfa, slow up, slav, scale up, slop, schoolboy, syllabify, slip-up, soil pipe, scalp, ski slope, salvo, slap, slave, sexual love, syllabub, slope, social phobia, sleep off, skylab, slip by, solfa, slip up, solve, sell up, sclaff, sleep, slap-up, swell up, slob, sylva, sick leave, sea wolf, SELPH, shelfy, slavey, slip away, shlep, sea scallop, salve, scallop, swallow up, sloop, slab. individual, mortal, somebody, soul, person, someone.